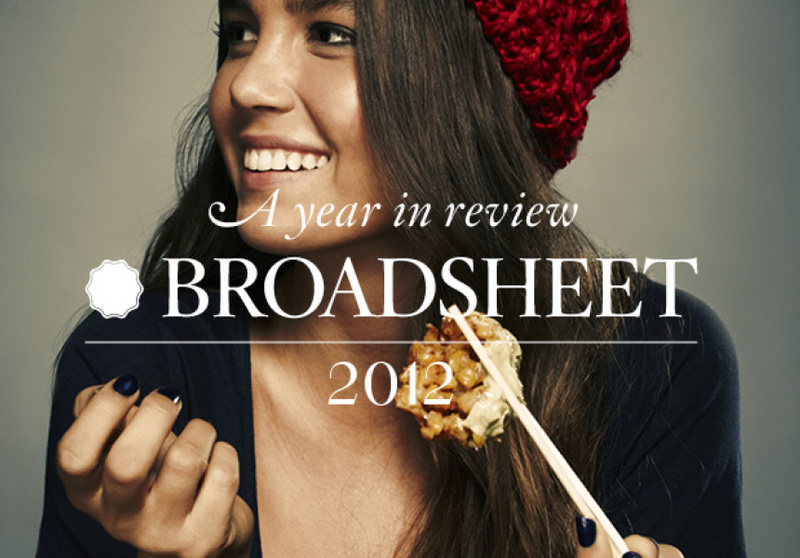 From standout events and inspiring people to the best cafe, bar and restaurant openings, we’ve had a lot to cover in 2012. 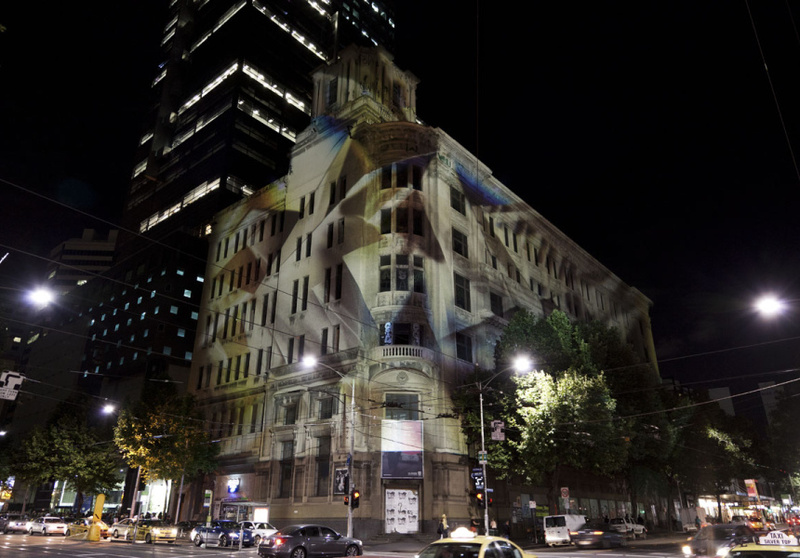 This is Broadsheet’s reflection on things that have shaped Melbourne this year. When the year comes to a close, we always think about how quickly if feels like it has passed us by. But on reflection, what also feels true of 2012 is just how much has happened between January and December. At this time of year, Melbourne is always abuzz, but looking back, this year feels as though it was electric all the way through. 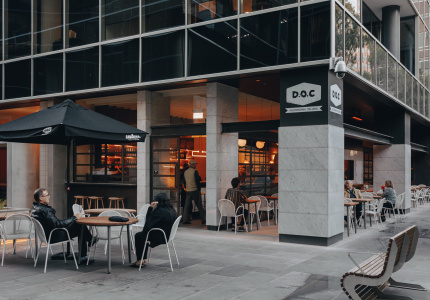 As we approach Christmas and summer holidays, we thought it a good time to take a quick look back at some of the year’s highlights – some of the things, places, people and events that have had a big impact on Melbourne and us – that we’ve covered in Broadsheet, and most importantly, that you have enjoyed. There’s this sense that Melbourne is really developing, changing and becoming one unto its own on both a local and international scale. We're seeing small operators curating unique international experiences and offerings and expanding their brands’ international presence, off their own bat. 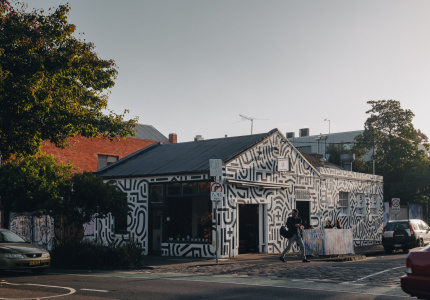 Small Melbourne business and consumers are now in engaging in the global marketplace and community like never before, both as importers and exporters of cultural product and this is something we’re keen to explore some more in the new year. But for now, we want to look back of some of best of 2012 – the events, new cafes, restaurants and bars, the shifting trends, habits and interests, and the people who have made a difference to our city. Be they big or small, we take a look at the happenings the shaped 2012. 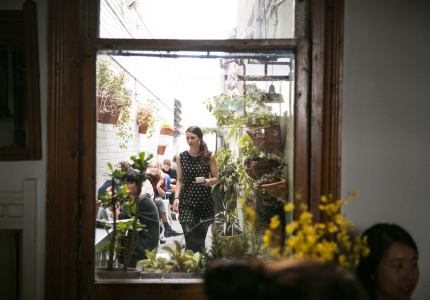 Overtaking venues, shops and laneways, Melbourne Music Week was back this year to shine a spotlight on our thriving music scene and throw a few parties in the process. Though still only young (2012 was its third year), the annual festival truly surpassed our expectations. From raves in a crumbling city building to Tim Sweeney at the NGV and Goblin on the Town Hall’s grand organ, this year was a blast. 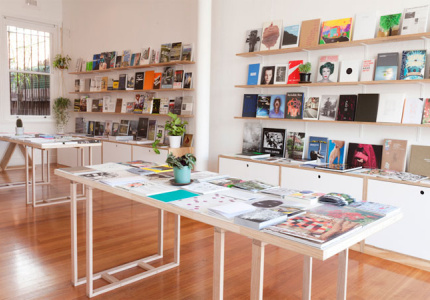 A change of pace from the large, commercial art fairs that have long marked Melbourne’s art landscape, smaller satellite fairs including newcomer The New Fair offered a boutique, artist-focused alternative to the Melbourne Art Fair. It’s not the first time we’ve seen this defection from the larger fairs (with events like Not Fair now in its second year). But The New Fair offered a uniquely international and contemporary experience, not just showing galleries from Australia (like host Kalimanrawlins alongside Perimeter Books), but those from New Zealand (Michael Lett, Hopkinson Cundy and Robert Heald Gallery) and the US too (New York’s Foxy Production), effectively blurring the boundaries between Australian and international artists and markets. January can be slow to start in Melbourne – we’re all easing back into work and life, getting back into our routines and earlier rises – but the So Frenchy So Chic festival brings an afternoon of French music, food and wine to Werribee Mansion, and puts a spring in our step. It’s been running a few years now, but like stinky French cheese, it sure seems to get better with age. 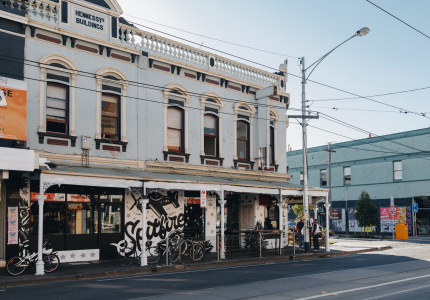 From big name chefs, mobile food and live music, to shipping containers with art and vintage clothing, The People’s Market in Collingwood is a lesson in unique community building. Open for five months over summer (from early December 2012), Touche Hombre, Phat Brats, MoVida Bakery & Thunder Road Brewery are all there alongside The COMA (Containers of Modern Art). The structure is designed to be portable, so will go to Brisbane over winter, then Sydney before it returns to Melbourne late 2013. 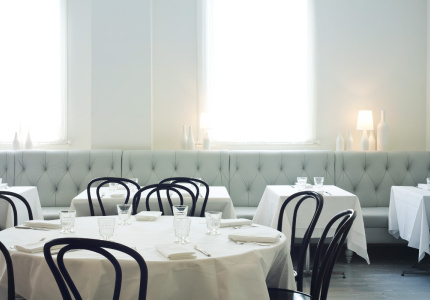 It’s all black and white at Patricia, a throwback to traditional European coffee bars. Bowen Holden (ex-Seven Seeds) is the man behind this charming, standing room only alcove, which is tucked up the corporate end of the city. 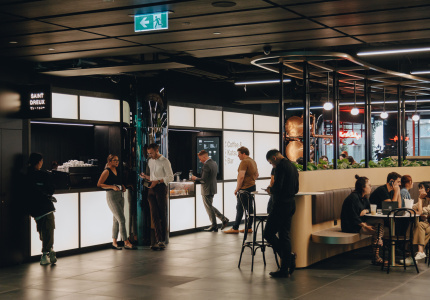 Opening earlier this year, they’ve been serving coffee with no fanfare (except for the super slick fit-out by Foolscap and Beyond the Pixels). 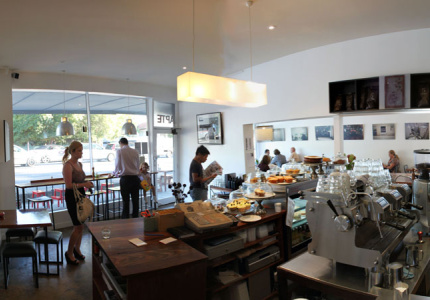 This is an insight into the contemporary Melbourne coffee scene at its best. 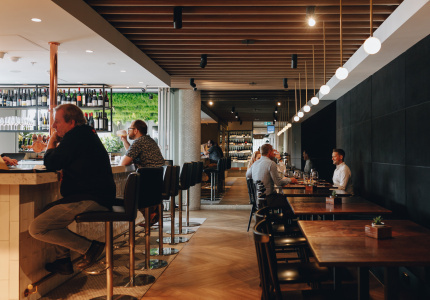 An eatery that produces zero waste, Silo by green-maker Joost Bakker and cafe man Danny Colls (ex-Café Racer and Liaison, Cafe Darling), takes the notion of the sustainable cafe to an entirely new sphere. 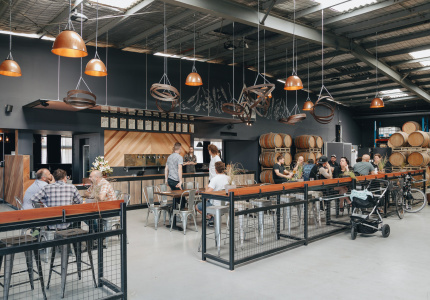 Silo was first set up on the banks of the Yarra for the Melbourne Food and Wine festival, but has now moved to it’s permanent space on Hardware Street, making coffee, breakfast and lunch for city slickers, all with no waste and plenty to recycle. 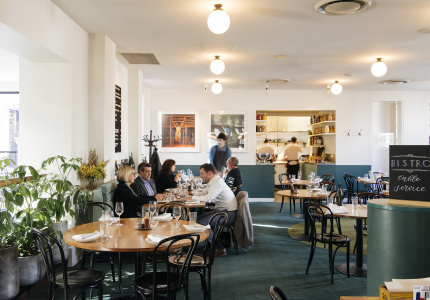 It’s no secret that we’re big fans of Andrew McConnell at Broadsheet, but when he re-imagined an iconic Fitzroy pub, transforming it from a bizarre old Fitzroy favourite to a slick, sophisticated eatery, there was always going to be mixed feelings. That said, it has been one of our favourite openings this year. 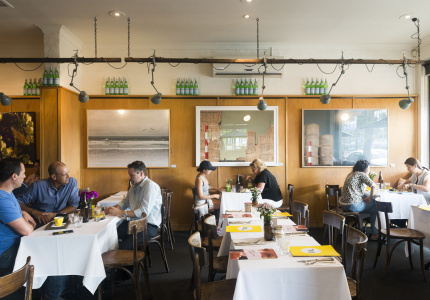 If not just the fancying up of the bistro, the revamped dining room out back at Moon Under Water has wooed us to no end. As has come to be expected from McConnell, this is something special. 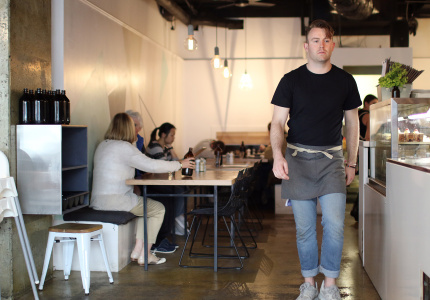 The team behind bustling cafes Three Bags Full, Liar Liar and Apte opened their fourth eatery this year in South Yarra. It’s their first project south of the river, but brings life to a rather dreary strip. Design is a huge part of this and they’ve pulled out all stops, from the interior to the food and the coffee. Indeed, one thing these guys are particularly good at is covering all bases. 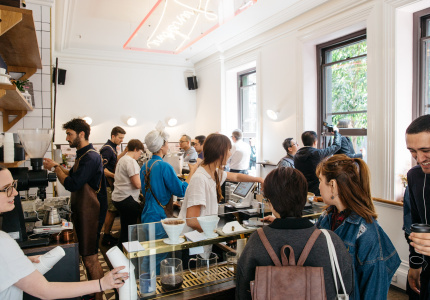 Here, they understand that while some people will appreciate a single origin pour over, others just want a really good, hot, skinny latte, and that’s fine too. 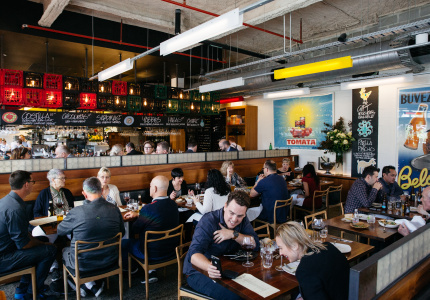 Back in April, the team at MoVida crossed the river to treat southsiders to a fine feat of baked goods. Baker and pastry chef Michael James had been making pastries and bread for MoVida Aqui for a few years, but expanded his repertoire to include loaves, croissants, Danishes, fat slabs of chocolate brownie and chunky, round doughnuts injected with salted caramel (our favourite). 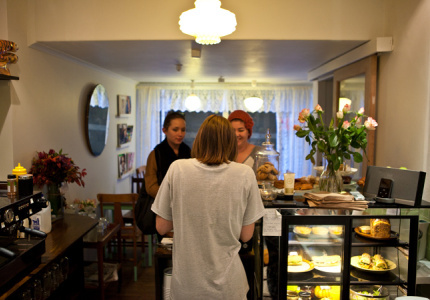 It’s simple and friendly at the MoVida Bakery, and another delicious extension of the MoVida brand. 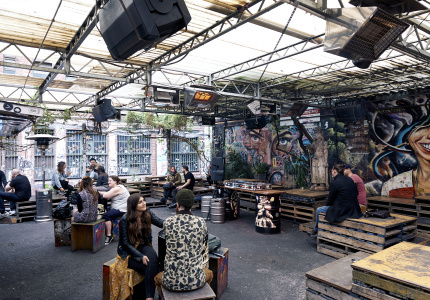 In Melbourne, we never get sick of rooftop bars. 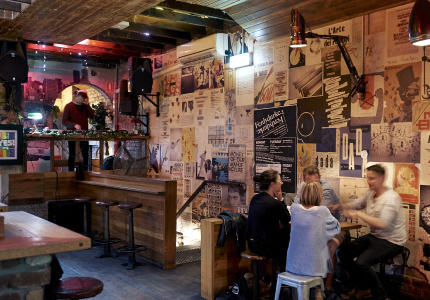 Perhaps they are an example of all that we enjoy about our drinking culture – tucked away off the main drag, hidden and with a view. Perhaps we’re over laneways. So when the Section 8 container bar crew set up a new joint, perched just above their original spot, we knew it would be worth the climb. And it is. Tony Ellwood’s appointment at NGV. The National Gallery of Victoria’s new director Tony Ellwood is redefining the institution’s relationship with artists and the public alike. We chatted with him about it for our summer print issue, going in depth about the challenges of changing course at a perhaps Australia’s most iconic art institution. It’s a big job ahead, but behind this country boy’s precociousness is ambition and a genuine want for change, so it’s an exciting time at the NGV. We’re excited about what’s to come from his contemporary art program in 2013. 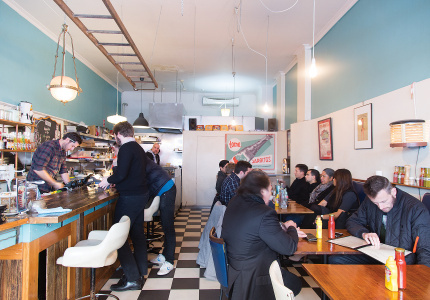 We often wonder if Melbourne cafe scene is really just a boy’s club. 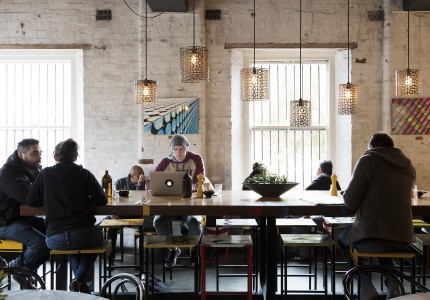 With our love affair with new cafes reaching epic proportions this year, we noticed that a majority of them are run and owned by young men. But where are the ladies? We found there were a few of them dotted around the city at places like Not Telling, Green Refectory, Milkwood, Galleon and Little King, but we also look forward to more ladies running businesses in 2013. We launched a new series on people we think are doing some pretty special things in Melbourne, and first up was Elise Peyronnet, a French lady who’s quite taken by our musical city, and us with her. 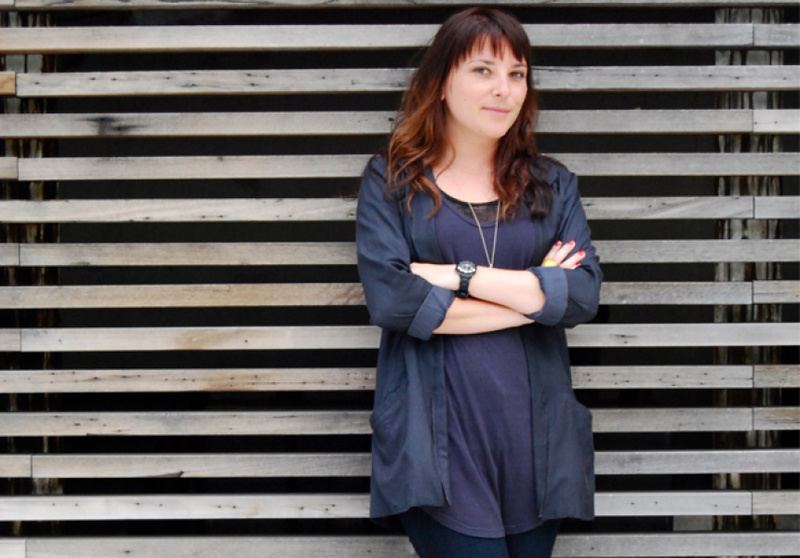 As the curator of Melbourne Music Week since its launch in 2010, Peyronnet has quickly made a name for herself as one of the driving forces within the Melbourne music scene. This year’s gig was her best work yet. We’ve also started talking to people who live and work in interesting places. These are buildings that are unusual, historical or largely unnoticeable, and we’ve been exploring these spaces and the people who build their lives within them. 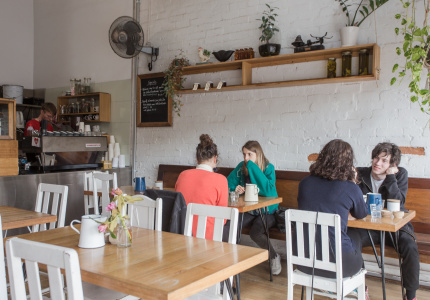 Most recently, we took a look at a space on Little Lonsdale Street where a family live in a seemingly exposed property, standing opposite League of Honest Coffee. Unravelling the stories behind these spaces is a fascinating endeavour, and there are plenty more to come. 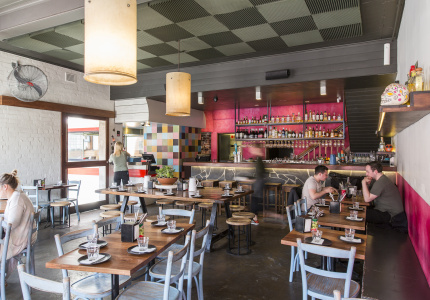 This year has seen a proliferation of Mexican eateries thriving across the city. 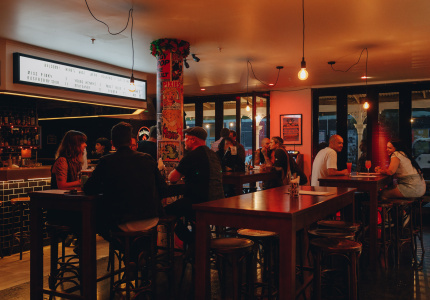 It’s cheap and accessible and we’ve eaten our way through enough guacamole and tacos and sunk enough margaritas to drink all of you under the table at places like Radio Mexico, Chingon and Touche Hombre. It’s been fun and we’ll never stop loving Mexican food, but we’re looking forward to donning something other than a sombrero in 2013. 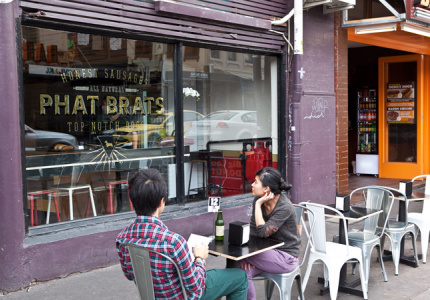 Burgers are a big sell at Broadsheet. But indulgent, greasy American food has also come into play too. 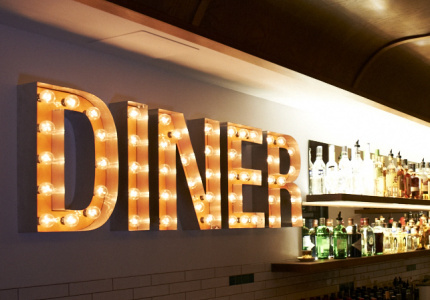 We’re talking fried pickles and chilli fries, onion rings, hots dogs and wieners, ribs and buffalo wings at American inspired diner-style eateries (think Belle’s Diner and Parlour Diner). It’s like a junk food revolution, but all shimmied up. But while simple and delicious, can we really handle any more burgers? Probably. We even found one guy who is documenting his journey through the fatty forest. We’re also eating way through more mozzarella than we used to. Have you noticed? 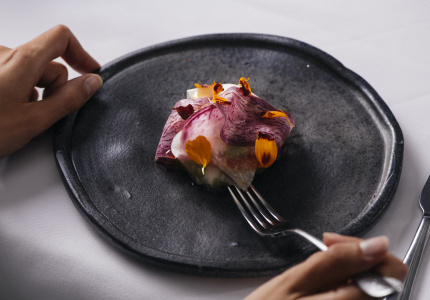 House-made cheese and home-cured meats are on menus everywhere, and Italian food is back in force, but not as we knew it (like on Lygon Street 20 years ago). 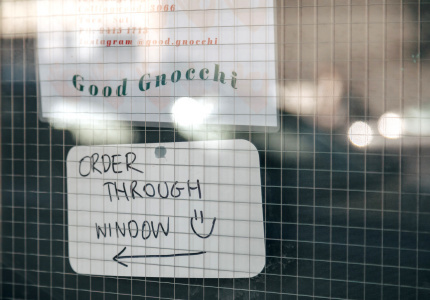 It’s a new, contemporary style of Italian eatery that we’re interested in. Off the back of that, we’re seeing more delis and procurers of handmade small goods offering all the meat and cheese we can consume. The boys at DOC opened a swish new deli on Lygon Street next door to Carlton Espresso, the team from ICKE & IGBY group (who brought us Friends of Mine, Porgie & Mrs Jones and Snowpony) have opened their new Italian delicatessen/restaurant Mazzatelli in Richmond, and Thornbury’s Umberto had a salami festa. 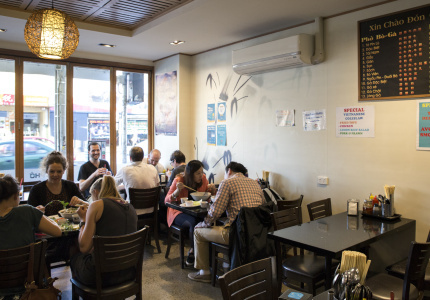 This food may just be the freshest of all Asian cuisines – clean, light, full of herbs and flavour, and fast – so we’re taking on the hawker styles of banh mi and bun cha, fast sandwiches, quick bowls of hot pho and rice paper rolls with gusto. Places are polishing up their offering and keeping it fresh and cool. 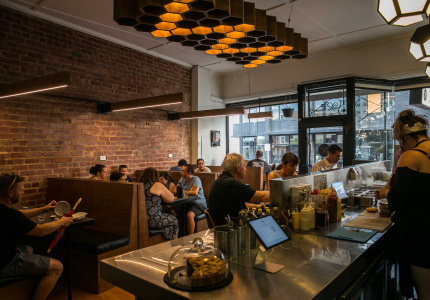 Misschu may have been doing it for years, but she’s rolling out her venues across the city to compete with places like Hanoi Hannah and boys at I Love Pho. And we’re slurping it all up.